After the big bang, the only elements in the universe were hydrogen, helium and trace amounts of lithium. There was no carbon, oxygen or iron, because these elements are only formed when stars undergo fusion in their cores. About 100 to 300 million years after the big bang, the first stars began to appear. These first generation stars were likely very large, about a hundred times the mass of our Sun. Because of their size, they had short lives which ended as supernovae. From the remnants of those stars, a new generation of stars would form. These second generation stars would have traces of elements such as carbon, but still lack heavier elements such as iron. Now a new paper in Nature (arxiv version) has announced the discovery of just such a second generation star. In astronomy, all elements other than hydrogen and helium are referred to as “metals.” For this reason, a measure of the amount of other elements a star contains is known as its metallicity. One way to define the metallicity of a star is simply as the fraction of a star’s mass which is not hydrogen or helium. For the Sun, this number is Z = 0.02, which means that about 2% of the Sun’s mass is “metal”. Another way to express the metallicity of a star is by its ratio of Iron to Hydrogen, known as [Fe/H]. This is given on a logarithmic scale relative to the ratio of our Sun. So the [Fe/H] of our Sun is zero. Stars with lower metallicity will have negative [Fe/H] values, and ones with higher metallicity have positive values. 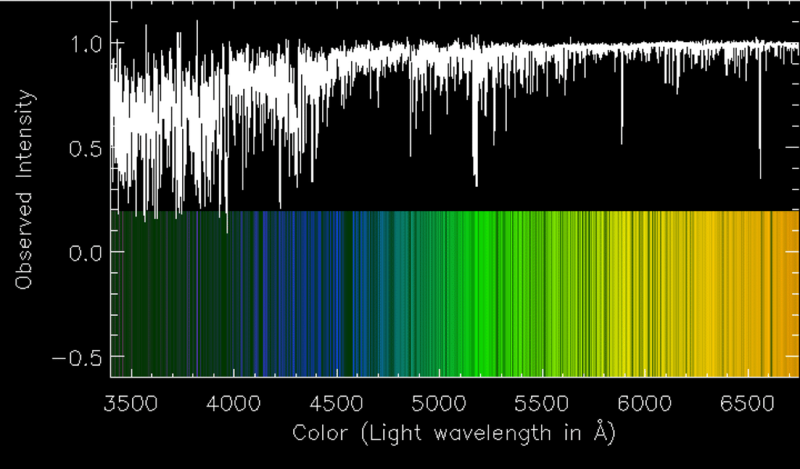 Spectrum of a low metallicity (Fe/H = -0.8) star. Credit: Anna Frebel. Stars are often categorized by their metallicity. For example, Population I stars have an [Fe/H] of at least -1, meaning they have 10% of the Sun’s iron ratio or more. Population II stars have an [Fe/H] of less than -1. There is a third category, known as Population III. These would be the first stars of the universe, with essentially no “metals” in them. We have yet to observe a Population III star, but this new discovery comes very close. This new star, known as SM0313 contains no measurable traces of iron. From its spectrum you can see carbon, calcium and magnesium, but nothing else beyond hydrogen. In comparison to the spectrum of a typical low metallicity star the difference is striking. Spectrum of SM0313. Credit: Anna Frebel. The complete lack of measurable iron in the spectrum is surprising. Based on the limits of their observations, the authors calculate the metallicity of SM0313 to be no more than Fe/H = -7.1. This means it is likely a second generation star, and its first generation progenitor ended in a supernova that wasn’t powerful enough to cast out significant quantities of iron. This changes our understanding of first generation stars. It has been thought that the large size of first generation stars meant their supernova would be a particularly powerful kind known as a pair-instability supernova. Such supernovae would cast out large quantities of material, and as a result the remnants of gas and dust would tend to be enriched and mixed on a relatively short cosmic time scale. As a result, even second generation stars such as SM0313 would have some measurable levels of iron. 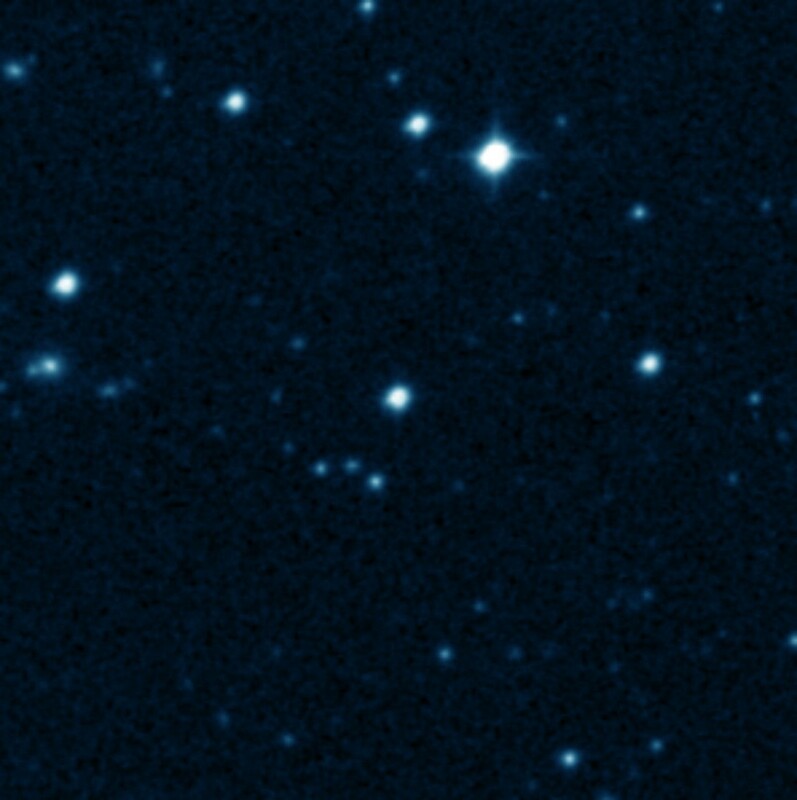 The discovery of SM0313 means that low energy first-generation supernovae were more common. Thus the mixing and enrichment of gas and dust happened more gradually than originally expected. The universe seem young, I would think that what has happen to our universe is not the first or the last time. But a series of events. What is your response. I wouldn’t call 14 billion years young, and it looks like the universe is nearly 14 billion years old.